With the Eastern Partnership summit and war games in Georgia well underway, Vladimir Putin decided to go where he could get away from both the EU and NATO. Japan, albeit technically still at war in Russia, looked the most appealing. Putin had just one day of talks on his schedule, but his time in Tokyo turned out to be very productive. The short time allocated was just enough for Russia and Japan to strike a string of deals that will likely take the bilateral economic ties to a new level. The Russian prime minister even took the time to present the Japanese edition of "Let's Learn Judo with Vladimir Putin," a Judo tutorial he co-authored. Putin delivered a speech praising Japan's culture, particularly music, folk dances, theatre and cuisine, which has lately become increasingly popular in Moscow. If the Japanese were to respond, they would most likely talk about Russian oil, gas and atomic energy, since this is what drew the most of their attention. The two sides signed a nuclear energy pact that will enable Russia to supply nuclear power plants in Japan with low-enriched uranium, while Japanese corporations will sell technologies and high-tech equipment to Russia. The countries will also look into joint uranium mining. The Head of Rosatom Sergei Kirienko said the potential contracts could be worth billions. With the new deals in place, Russia will double its uranium exports to Japan. Other deals included the Japanese state-run company Japan Oil, Gas and Metals National Corporation agreeing to develop two major oil fields in Eastern Siberia along with the Russian Irkutsk Oil Company. Gazprom likewise made an appearance during Putin's tour. Its CEO Alexei Miller announced that the construction of a pipeline between Sakhalin, Khabarovsk and Vladivostok had been launched, and the pipeline would be up and running by 2011. Gazprom also signed a memorandum with the Japanese government, Itochu Corporation and Japex to explore the possibilities of producing and shipping natural gas from Vladivostok to Asian customers, including Japan. Japanese companies Mitsui and J Power also agreed to help Russia build a wind power plant in Primorye. 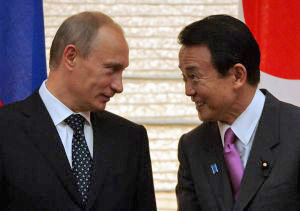 Putin made it clear that he came to Japan to do business, and has fulfilled his mission of boosting economic ties. "The visit was very successful and the objectives Putin had for this trip were accomplished. I think Russia got even more than it planned to. We are facing major geopolitical pressure in Europe, so Russia is looking to develop economic ties in the Far East. We have a vast territory there and plenty of resources, but the region isn't very populated and what we see now is positive for its development," said Alexei Makhlay, the first deputy director of the Russian Public Policy Center. The annual trade turnover between Russia and Japan currently amounts to $30 billion, a six-fold increase from 2000. Putin's fruitful trip made sure that the substantial growth will continue in the coming years. But since Putin was acting in his new role of Russia's prime minister, developing business links and inking economic deals was the point of his visit, despite the Japanese making more attempts to resolve the hottest issue in bilateral relations-the territorial dispute between the two countries over the Kuril islands, known as the Northern Territories in Japan, which it lost along with half of the Sakhalin island in the aftermath of the Second World War. In an interview he gave to the Japanese media before starting his tour, Putin said that it is important to work on building solid business relations first, and then the sides would be ready to talk about political matters of such great significance. During his visit Putin once again touched on the issue, stating that it will be tackled by the Japanese Prime Minister Taro Aso and the Russian President Dmitry Medvedev at the G8 summit, scheduled to take place in Italy in July. He thus passed responsibility for settling the matter over to Medvedev. "[Talks with the Japanese] always end with their inquiries about the return of the four Kuril islands. There's been a few proposals, the latest being to split them in half. Putin carefully listened to all the proposals the past and present Japanese prime ministers have made, but silence does not equate with agreement. He just diplomatically delayed the issue," said Makhlay. With no resolution in sight, postponing discussion seems to be all there is to do. Hope that a peace treaty, which has never been signed because of the territorial dispute, will be finally sealed at the G8 after the meeting between Aso and Medvedev appears illusory. Russia is not exactly eager to cede any portion of the south Kuril Islands, which isn't merely a matter of pride, since the islands are rich in fish. Regaining the lost Northern Territories is of utmost importance to Japan, but it might be forced to put the issue on the backburner once again to take care of more pressing issues. The energy poor country is relying on Russia to secure as many supplies as possible, while Russia needs Japanese investment and technologies to make its own projects work, such as the Eastern Siberia - Pacific Ocean pipeline, which needs more oil fields to ensure enough supplies to keep the pipeline running for more than ten years. "There is enough supply for ten years, and we're supposed to ship oil to China for 20, so there is a little problem. We could try to develop our fields on our own, but we could end up short on money, workforce and technologies. Japan could bring that along with energy-efficient and high-tech equipment and. It is also positive that such deals are made on the state level, which means cheaper loans for the companies," said Andrei Kochetkov, a commodity analyst at RosFinCom. Japan is also a counterweight to China that, if left as Russia's sole major partner in the Far East, would have too much leverage in helping Russia develop the fields while demanding significant concessions. "This country was a leading provider of capital for the rest of the world, but now the money is going back to Japan and they need to employ it somehow. Japan wants to partake in the development of oil fields and other energy projects. They're directly improving their security this way, before the economy starts to recover, bringing back the competition for energy resources," Kochetkov added. But whether Medvedev and Aso succeed or fail to resolve the Kuril puzzle and sign the peace treaty, it is not expected to have much of an impact on bilateral business ties. "We have a peace and friendship agreement with Ukraine, but our relations deteriorate by the day, so it's not that big a deal. Should [the Japanese] hold on waiting to get the peace treaty and the islands, they'll end up seeing China getting its hands on all there is to grab," said Makhlay.